Soon to be no more? We were overwhelmed by the response to the consultation, the most we’ve ever seen in recent years. 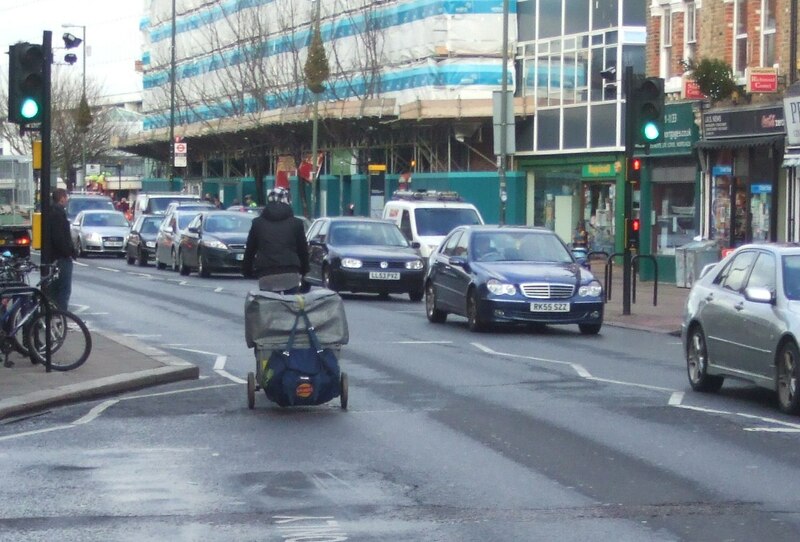 And it showed in the results, with LBRUT issuing a press release which showed that over two thirds had rejected the council’s proposal to remove the London Road cycle lane. We shall continue to follow the progress of this consultation, we all want to have a Twickenham town centre that is safe and inviting to visit. We trust that the council will listen to the strong message this consultation has delivered and not only retain and improve this lane, but look to provide high quality cycle infrastructure across the borough that we would feel comfortable allowing our children to cycle to school along. We’ve previously posted on the Twickenham Area Action Plan and we submitted a very detailed analysis of their previous proposals which you can read online. The current stage of the consultation process runs from 6 July to 31 August and is the final round of public consultation before the Plan is submitted to the Secretary of State for independent examination. It covers two main sections – The Twickenham Action Plan and the Street Scene and Highways Improvement Scheme. 4.3.1 The Transport Strategy maintains cycle routes throughout the town and cyclists will benefit from reduced traffic levels within London Road, King Street and York Street. The existing quiet route via Twickenham Embankment will be retained. All routes will be supported with appropriate levels of signage. 4.3.2 The widened footways will allow new cycle parking facilities to be introduced which will provide locations for more convenient access to town centre facilities. To comment on the plan (full details here), download the representation form and email to Ldfconsultation@richmond.gov.uk before 5pm Friday 31 August 2012. 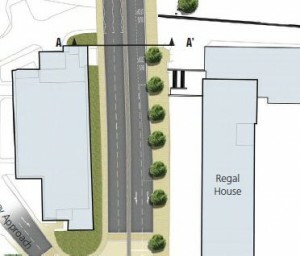 Safe inviting streets of Twickenham? 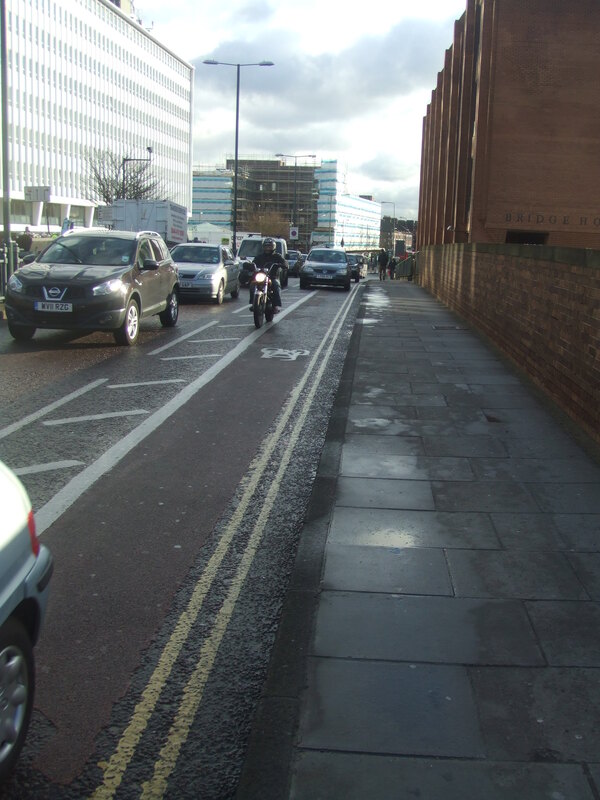 You have to look at the Street Scene and Highways Scheme (full details here) to find that the widened footways are achieved by removing cycle lanes that let us get past log-jammed traffic. So much for maintaining cycle routes. This has a separate, less formal, tick box consultation – please make your thoughts known (closes 5pm Friday 31st August 2012). If all our readers could respond it might at least embarrass the council who will be publishing the results. We feel this is a missed opportunity. Rather than removing the cycle lane, they should have improved it, putting in a proper physical division to stop encroachment like that shown in the picture at the top of this post. They should have improved the connection to the railway station; we’d previously raised this as a concern in our audit of Twickenham Railway station back in 2010, part of a review of all 13 stations in the Borough. The council is convinced this is an improvement, completely misunderstanding why people do not choose to cycle in the borough. The reason why the share of cycling as a mode of transport is relatively high in the Borough (though still only 5% – compare that to the Netherlands where, where up to 40% of railway passengers get to the station by bike) is because of the large number of off road cycle routes – along the Thames, through the parks. This demonstrates the need to have safe cycle infrastructure on busy roads. Would you allow your 10 year old to cycle to Twickenham station or through the town centre unaccompanied? Please take a couple of minutes to fill in the tick box consultation – otherwise we’ll continue to be ignored. 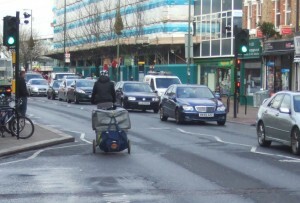 This entry was posted in Campaign, Consultation and tagged Consultation, Cycle Lane, Twickenham by Paul Luton. Bookmark the permalink.